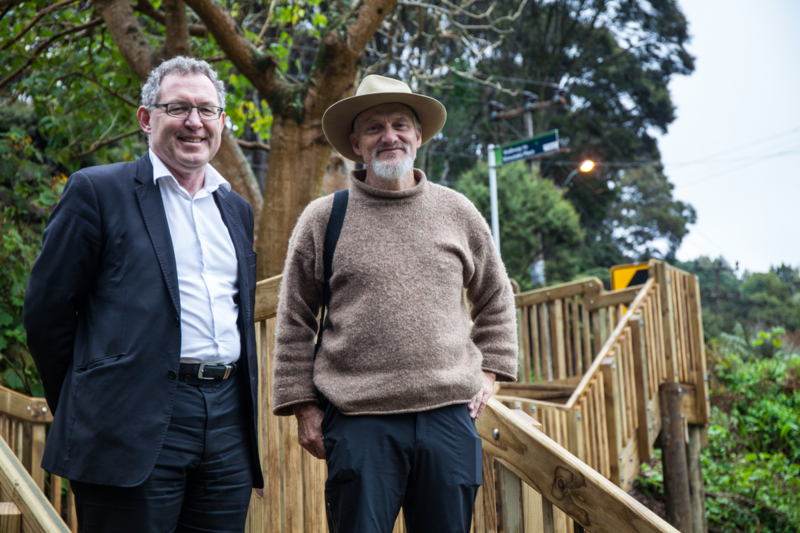 Neil Henderson has been heavily involved in the design and construction of the Rimutaka Walkway and deserves praise for his work. The walkway is now essentially complete and a formal opening is to be held soon. The walkway will help in linking the Woodlands Park community to the Landing Road walkway and improve pedestrian access in the area. The surrounding area is remarkably beautiful and if you need either exercise or soul cleansing immersion in nature or both this is one walk you will want to take. The Board’s draft Greenways Plan is being readied for release for consultation. The intent is that this will drive the creation of further walkways like the Rimutaka walkway. The benefits are immense for both congestion and health, more people walking makes for a healthier and more sustainable community. Following the release of the Auckland Council report on Kauri Dieback in the Waitakere Ranges thought is now being given to what to do. As I noted previously the news is dire. The Waitakere Ranges has by far the greatest concentration of the disease. Over half of the areas in the Regional Park have trees showing signs of the condition and the rate of infection appears to have doubled since the previous survey was completed five years ago. And it is clear that infection is concentrated around tracks and bait lines. The latter may be the result of infections caused before the use of trigene and hygienic boot cleaning methods. Everyone that I know who are involved in bait lines are really keen to preserve the Ranges the way they are. And it may be that bait line infections are due to lower hygiene standards from years ago rather than recent infections. But the statistics for use of the trigene stations on the tracks are deeply concerning with most people not using the brushes and trigene disinfectant to clean their boots. The following table shows how clear the relationship between infection and the tracks is. Council is to urgently upgrade all cleaning stations with better equipment so that the cleaning process is easier and better. But everyone has to do their part. If you are walking in the Ranges on one of the tracks please make sure you clean your shoes properly. Drastic measures are being contemplated. I believe that we have to consider the possibility of track closures. A Rahui over the Waitakere Ranges has been proposed by Te Kawerau A Maki and may be necessary so that we can at least stabilize things until we understand more fully what is happening and work out a long term containment plan. But clearly this will not be popular. I have received an expression of concern from the organiser of the Lactic Turkey event who is worried about what may happen. And I have seen a report suggesting that the hygiene methods used by the organisers of the race are pristine. So this is not going to be a straight forward process. In the medium term an upgrade of the tracks with boardwalks or with proper drainage will be required to preserve existing Kauri. There will be a significant cost. Central Government funding may be needed. But if we want to make sure that the King of the Forest remains we will need to do whatever is required to stop the spread of this most destructive of diseases. The Board considered the report at its last meeting. We passed resolutions noting that the Waitakere Ranges Regional Park is now the most heavily kauri dieback infected area currently recorded in New Zealand and that the recorded distribution of kauri dieback in a kauri area has essentially doubled in the past five years. The highest risk vector for Kauri dieback movement into new areas is soil disturbance associated with human activity. We also noted that compliance with hygiene requirements is very low and must increase if we are to prevent kauri dieback spread. Our resolution urged Council to urgently upgrade Phytosanitary stations to the most effective models available so that the spray bottle and brush station are superseded, to seek more funding from Central Government because of the national significance of kauri, and because both local and central government are obligated to uphold the Waitakere Ranges Heritage Area Act 2008. We requested adequate funding to increase maintenance and improve drainage on tracks, and upgrade selected tracks to reduce possibility of infection. On the issue of track closures the Board wants Council to give this consideration although in consultation with the Board and external stakeholders. The Board also wants public education to be increased. Current use of the hygiene stations is far too hit and miss and we need to do better. I became involved in local government primarily to support meaningful protection for the Waitakere Ranges and one of the areas I was most proud to be involved in was the development and passage of the Waitakere Ranges Heritage Area Act 2008. Ever since its passage I have had a keen interest to monitor its performance and to see if it is achieving what it was intended to achieve. The Board has taken very keen interest in the development of the Unitary Plan and made submissions to the Panel when hearings were conducted. Our preference was that the intent of the Waitakere Ranges Heritage Area Act be followed and existing District Plan provisions retained. One area where this is important is the ability to subdivide. Through much of the ranges subdivision down to a certain size was permitted but any subdivision below those sizes was prohibited. The intent was that a certain amount of intensification would happen but after that the level of development would be capped. So it was of concern when the Hearings Panel recommended that subdivision below permitted levels be classed as non complying rather than prohibited. The difference is that land owners could still apply and try and persuade the decision maker that a particular subdivision should be allowed to proceed. The almost inevitable result would be that over time the heritage area could be fundamentally changed. An individual decision to subdivide may not have had much effect and the temptation would be to let it through but the cumulative effect of a number of these decisions could have been profound. As the former Parliamentary Commissioner for the Environment Morgan Williams said the Ranges would suffer death by a thousand cuts. The protection offered by the Act would have been weakened considerably. Council confirmed the decision even though it was urged not to. The Waitakere Ranges Protection Society then appealed the decision claiming that the original recommendation was flawed in that it did not give sufficient weight to the provisions of the Act. I am pleased to say that Auckland Council supported the appeal and that the appeal was granted. The appeal has been granted in a way which will allow submitters to the original provision to appeal to the Environment Court against the change. There has been a lot of local concern that two rather magnificent roadside Kauri on Paturoa Road may be threatened by works being conducted on the site. The litigation relating to the work has resulted in the landowner deciding to surrender the consents so for now the roadside Kauri are safe. There are live issues however about what if any development around these trees should be allowed as the original analysis about the trees drip lines relied on by the consent may not have been optimal. Through the Unitary Plan process the significant ecological area zone for this property was removed. This included the part of the zone that was on the road reserve. Various people have raised concerns with me that this means the roadside Kauri are no longer protected. I have raised this with Council staff and I have been advised that although they do not see an urgent need to reinstate the significant ecological zone for the area as a matter of urgency this could occur as part of a review over the next five years. In the meantime the trees are protected in that their removal would require a resource consent as well as Council consent. I have advised the staff that the Local Board regard this as a significant issue and any application that may affect the trees should be brought to the local board’s attention. The liaison group is meeting regularly and I have been able to attend two of the meetings. Agreement has been reached concerning an ecological survey and who and how it will be completed by. Clearly we are getting close to design decisions being made. One aspect which I believe will be contentious is Watercare’s desire to place two large reservoirs on the Exhibition Drive side of Woodlands Park Road. If the design is not sensitive there is the prospect of a prominent group of Kauri being affected. Along with any incursion into the Clark’s Bush Walk area this particular aspect possibly represents the most significant threat to the local environment. Finally a few comments on my recent trip to China. I spent time in Hong Kong, Beijing and Shanghai. These are big cities, Hong Kong has 7.4 million people, Beijing has 22 million, and Shanghai has 24 million. I had expected to go to cities that were hopelessly gridlocked with air pollution that was out of control, similar to the photo below which was taken in 2014. But the cities’ skies were remarkably clear. It may be because I was in China at a good time. It could be that China’s aggressive phasing out of coal fired power plants is having an effect. But the rate of growth of its underground rail in its major cities in the past 30 years has been phenomenal. Shanghai has more than doubled its underground rail from 260 kilometers to 640 kilometers since 2008. Beijing has nearly tripled its underground rail going from 200 kilometers to 570 kilometers. By comparison the city rail link is 3.5 kilometers and it will take a similar time to complete. The frequency is every three minutes. There literally is no waiting. And the price is phenomenal. For the equivalent of 60c I was able to travel half way across each city at a speed that the local taxi drivers could often not match. And the cities, particularly Beijing really look after their walkers and cyclists with dedicated cycle lanes being very prominent and hire bikes being easy to locate and use. And the effect on congestion? Shanghai for instance is geographically six times the size of Auckland but has nearly 20 times the population. And the congestion is no worse than Auckland’s. It is clear to me that we are not going to be able to road build our way out of our current congestion problem. Fast reliable public transport is the only way to address congestion. Light rail on the North Western motorway, on the Isthmus and to the airport should be a priority. And if we want to do something about climate change then it needs to be electricity powered.